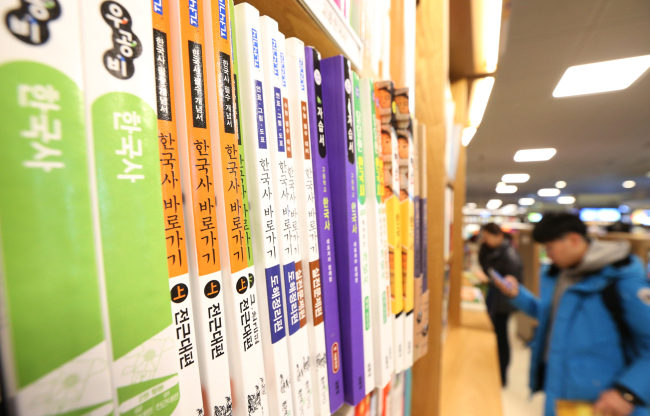 Foreign publishers have increased coverage of South Korea in textbooks, with more of them marking maps with the Korean name for the sea between Korea and Japan, Seoul's education ministry said Tuesday. The increase was reported during a meeting of a public-private panel tasked with correcting errors and broadening coverage related to Korea. Vice Education Minister Lee Young presided over the meeting with officials from the foreign ministry, fisheries ministry and civic group VANK in attendance. "I hope that through this public-private partnership, we will see a continued realization of good ideas for correctly promoting South Korea in the form of practical cooperation projects," the ministry quoted Lee as saying. Last year, Chilean textbook publisher Origo revised an educational map to replace a photo of India's Taj Mahal with a photo of Seoul's landmark Cheonggyecheon stream by night, the ministry said. Since 2015, the publisher has also distributed maps marked with the name East Sea, not Sea of Japan, to the country's public schools. Zig-Zag, another Chilean publisher, began to use the Korean appellation for the sea in its textbooks last year. Meanwhile, a Hungarian publisher significantly increased coverage of South Korea's economic development in a new history textbook for 12th graders starting in the 2016-2017 academic year, according to the ministry. The textbook introduces South Korea's rise from the ashes of the 1950-53 Korean War with a graph of the country's per capita income by year.